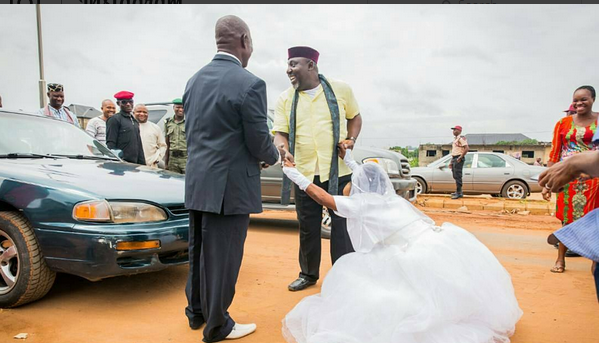 A couple who tied the knot today couldn’t contain their joy especially the bride after she encountered the executive governor of Imo state, Rochas Okorocha. You are blessed my Governor, my Governor, God this can only be You at work!!! Those were the words that spilled out from the mouth of this overjoyed bride and her husband who were on their way to the church service to be joined in holy matrimony. The governor was reportedly on the road doing his usual inspection and tour of the state earlier this morning. Their joy knew no bounds as she went on the floor in gratitude to God for such an honor. The Governor handed cash gifts to the family in celebration with them.